During my public lecturing on Judeo-Arab liturgical music, I often play recordings. Invariably, after hearing the thoroughly Arab sounds—sounds that, for many attendees, evoke images of the Muslim muezzin’s call to prayer—someone in the audience asks, “What is Jewish about this music?” Mark Kligman artfully answers this question in his comprehensive study of the Judeo-Arab synthesis between the music and text of the Shabbat liturgy of Syrian Jews living in Brooklyn. The author endeavors to provide a descriptive analysis of the Sabbath liturgy as well as a cultural lens for understanding Syrian Jewish identity (11). The Aleppo Syrian Jews of both Brooklyn and Israel are known for their appreciation and punctilious maintenance of the Arab maqam—traditional Arabic music’s system of melodic modes—in their liturgy. While other studies have examined other aspects of Syrian Jewish liturgy, Kligman’s is the first to document and analyze Syrian musical practices in the Sabbath service. In Part I, the author lays out his research approach and provides historical background. He offers a concise and very helpful history of the Syrian Jewish community in chapter two—from the fifteenth century under Ottoman rule to present day Brooklyn. Syria’s economic decline and the rise of anti-Semitism in the nineteenth century ultimately led to the large emigration of Jews to several locales, including the United States. In chapter three, he demonstrates how changes in liturgical practice often reflect the conscious choices of a community in asserting its identity. For example, while the Syrian liturgical textual tradition does not differ significantly from those of other Sephardic traditions, Kligman highlights how the printing of prayer books specifically for the Brooklyn Syrian community became an important priority in the 1980s and 1990s (38-45). While not a necessity, these prayer books represented the community members’ pride in their heritage and their desire to distinguish themselves from other traditions. Part II comprises the bulk of Kligman’s original field research on the nuances of both the Arab maqam system and the Syrian Shabbat service. Unlike the Ashkenazi Jewish tradition (and some Mizrahi traditions) where Shabbat nusach—the system of Jewish prayer modes—are the same each week, the Syrian Jewish tradition emphasizes a different maqam each week. The foreshadowing of the “maqam of the day” occurs in the early part of the service and at the service’s climax, Shacharit; the highly skilled cantor—following in the tradition of the great Arab classical singers such as Umm Kulthum—“must remain in that maqam and establish it for at least ten minutes before moving to another maqam” (102). Yet, just as in Arab classical music, the changing of maqamat creates interest and suspense, and congregants expect an adept cantor to provide a prudent amount of maqam diversity once the week’s maqam has been established. Only those cantors and congregants with a sophisticated knowledge of both Jewish ritual and Arab music theory, therefore, are capable of leading services. Kligman underscores that even those Sabbath attendees incapable of leading service themselves are highly educated listeners; they understand the subtleties of the cantorial rendering of the service and can be very critical if their high standards are not met. In Part III, “The Judeo-Arab Synthesis,” Kligman skillfully demonstrates how the nusach of the Shabbat service is guided by the Arab maqam system. As any musician or devotee of Arab music can tell you, each maqam is said to have its own affect (e.g. happiness, sadness, austerity) and specific maqamat are reserved for certain occasions and life cycle events for this reason. Similarly, the author explains in chapter ten that the maqam of the specific Sabbath day is often chosen for its connection to the mood and theme of the weekly Torah portion. On Sabbaths where the Torah portions mark the deaths of certain important Biblical figures, for example, the cantor employs the traditionally sad maqam hijaz (170-171). Yet Kligman also points to several other factors, such as theoretical considerations, that determine the choice of the maqam of the week. Since maqam rast is viewed as the most fundamental maqam in Arab music theory, all Sabbaths where the weekly parashah (scriptural reading) begins a new book of the Torah feature rast as the maqam of the week (172). 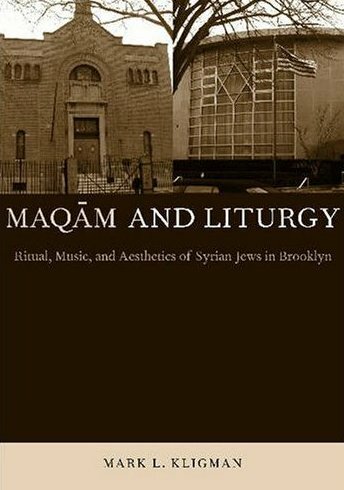 Through such examples, the author demonstrates how Arab music practices fully guide Syrian synagogue ritual in Brooklyn. The author’s meticulous research is evident throughout the book; he gains insights that only a seasoned ethnographer deeply established in the community would decipher. The companion CD of Syrian liturgical chanting is quite useful in allowing readers to further understand the examples described in the book. Chapter seven, for example, illustrates how Syrian Jews draw upon secular classical Arab music for their pizmonim (paraliturgical hymns); musical examples 11 and 12 allow readers to hear how the Hebrew of the pizmon “Bo’i be-Rinah” closely models the poetic construction, assonance, and rhythmic scheme of the original Arabic song “Hawwid Min Hina.” These musical examples further the point that this practice represents an integral part of the Syrian cultural tradition, and a Judeo-Arab homage to the Arabic music of their heritage, rather than “simply borrowing” (216). Kligman’s study underscores the immense pride Syrian Jews feel toward their Arab musical heritage and their steadfastness in preserving these traditions in their Shabbat services. Ironically, these same Jews—so steeped in the Arab musical tradition—rarely attend Arab musical performances outside of the confines of the Judeo-Arab world because of “political tensions between Arabs and Jews in Israel” (36). The author’s research reveals that Syrian Jews express their Arab identities most saliently through Jewish prayer, and one wonders whether they have an interest expressing their Arab identities beyond the Jewish realm. Do Syrian Jews in Brooklyn, for instance, encourage their children to study Arabic? Though we will have to wait for Kligman’s future writings for answers to that question, what the author teaches us about Judeo-Arab music was well worth the wait. Returning to the question asked by so many non-Syrian Jewish listeners, “What is Jewish about this music?” Kligman’s answer: the texts. His research demonstrates that while this music is wholly Arab—from the melodies, performance practices, and the theoretical guidelines that cantor and congregation follow—“Arab music and the Jewish text inform one another in multiple dimensions” (3). The same with the Iraqi jews liturgy and prayers. It is all based on the Maqam Phenomenon of the Arabs and Turks. It is the same with the Muslim Arabs liturgy in Iraq and as far as I know in Egypt too. It is thought that the conservation of the Maqam through the liturgy in the Middle East pour some light on the essence and nature of the music of the Arabs before the sunset on their culture in the first third of the second mallenum of which we have no recordings of-course. Thank you for informing me about this literature.